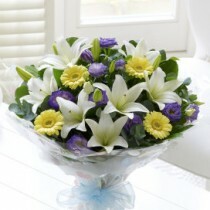 A new baby boy is here and you can send your congratulations with this delightful arrangement of fresh flowers. 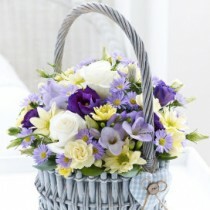 We’ve chosen soft lilac and purple shades and contrasted them with fresh white and lemon to create this charming arrangement. 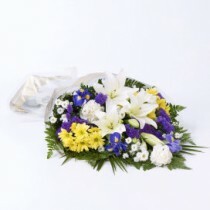 The result is a pretty gift of flowers that can be displayed and enjoyed straight away. 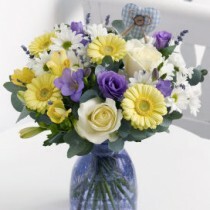 Featuring 2 lemon carnations, a purple lisianthus, a white Oriental lily, 2 ivory large-headed roses and a lilac September flower with eucalyptus arranged in a cream ceramic pot and finished with a blue gingham heart tag. 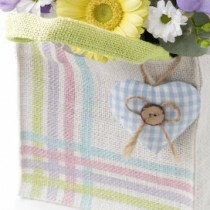 A thoughtful gift for the new Mum and Dad, this pretty white basket is brimming with treats. 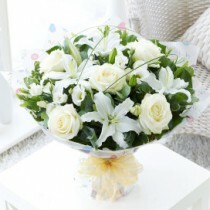 There's a beautiful cream miniature rose plant to mark the birth of the new arrival and a delicious box of chocolates too. We really couldn't resist a soft toy - so we've included a snuggly white rabbit for baby as well. Featuring a cream miniature rose plant, a white rabbit soft toy and a 120g box of Maison Fougère chocolates in a white basket. 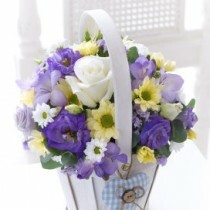 Celebrate the arrival of a new baby boy with this exquisite gift of fresh flowers. 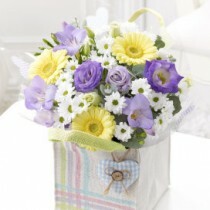 We’ve chosen cool shades of purple and lilac and added soft peach and cream. 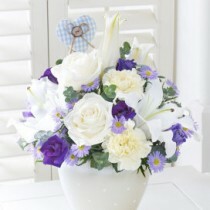 The display is finished off with a stunning, large-headed white rose at the heart of this vase arrangement. 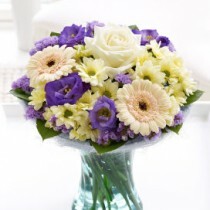 Featuring peach germini, a white, large-headed rose, cream spray chrysanthemums, a purple lisianthus and lilac statice with salal, arranged in a curved glass vase with a blue sisal collar.